This November wedding only a few miles from Nashville still has us swooning. 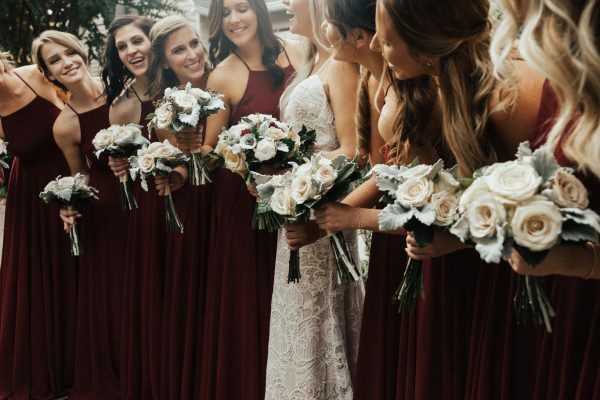 From the modern lace details in Cadey’s wedding gown to the perfect fall colors in the garden at CJ’s Off the Square, every detail perfectly matched this incredible couple. The burgundy floral design with a touch of greenery on the couples dark wood sweetheart farm table really set the tone for this moody, outdoor fall wedding. Every detail of this day was so thoughtful, down to the hand painted reception portrait from one of Cadey’s bridesmaids. They even made CD’s for their guests with key songs from their wedding day as favors! So Nashville! Cadey gifted her brand new husband an awesome motorcycle and the joy on her face giving the gift is almost matched by Nathan’s pure shock and gratitude… We love this couple!! Make sure to watch their wedding trailer below to see what we mean. Thank you so much Katherine Joy Photography for capturing the love and pure happiness this wedding oozed. And a huge thank you to John Myers Videography for this incredible wedding film (scroll down to view….it’s worth it!). Want this to be your wedding? Call or click to learn more about our full service event packages that make planning your next celebration SO EASY!